Windows backup recovery for corrupt BKF file can be perfectly executed with our small sized and smart utility. In the form of BKF Recovery software, we have assembled a set of foolproof algorithms and a simplified interface together so that complete solution to salvage Windows BKF data is rendered to you. » Select a Location : You can choose a location of your choice to save the data recovered from Windows backup file. The data can be saved in any of the partition on machine: Internal or external. » Original Location : This works if the BKF is restored on same machine where it was created. If this is opted, the recovered data will get saved on the same location where it was saved at the time of backing up. To scan the selected BKF file and recover data from it, there are three different options available in the windows backup recovery tool that can be adopted as per requirement. » Quick Scan :- If the file is expected to have minor inconsistency, choose this option to scan the BKF file. » Deep Scan :- For major issues restricting successful restoration of BKF file, this option is added in the tool. » Range Based Scan :- If a portion of data has to be extracted from BKF file, this scanning mode is the best. The BKF file scanning is followed by previewing of backup data. The folders in the BKF file are displayed at the left size of the preview pane in a hierarchical form. Selecting the folder will give a view of files saved in it at the right side of the pane. The tool to extract selective files and folders of the backup file. 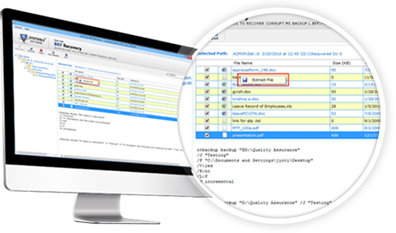 Enabling the check boxes for files or folders in the preview pane allows restoring selected files from the BKF file. If entire backup data has to be restored, choose the "Extract" option from the menu bar. The software is developed with the potential to restore data from BKF file that is in corrupt state. It retrieves all file (s) & folder (s) in their original format. Documents, images, music, & other type of items can be extracted using this Windows based MS backup restore tool. When software lists all the recovered files and if user is not able to find for the particular file then with the help of Search Box user can add the name of the specific file or the extension and find it. Helps to easily search for a particular file among the bulk of available bkf files. Demo version of the software provides you complete preview of the recovered backup .bkf / .zip files but you can not extract them. To give an idea about how to repair corrupt Windows backup file by using this tool, its free version is made available to you. With the freeware windows backup recovery tool, the backup data can be recovered and previewed. The final action, i.e. extracting the BKF contents is restricted in the demo version of the tool and is activated with the activation key. 1 : The tool gives the facility to recover MS backup database on all versions of Windows Operating System. Meanwhile, the state of BKF is not a matter of concern with the tool. Even a corrupt BKF file can be added for recovery that is reverting back with errors while restoration. 2 : The software extracts data from the BKF file and restores it in the original format. The BKF file created with the Windows built-in NTBackup or third party VERITAS Exec utility can be recovered with the tool. Can Demo Version of The Tool Save Some Amount of Data? No, you can use the demo version of BKF repair software to repair the damaged BKF file of any size but when you will try to save some amount of data, it couldn't. I Am Getting Error "Wrong Credentials" or "Invalid Credentials" What To Do Next? You should contact our support team to get valid activation key to fix "Wrong Credentials" or "Invalid Credentials", error. Does This Software Repair Windows Backup File of Windows 8 Machine? Yes, being a Windows based utility software works with any edition of Windows and repair corrupt bkf data. How Much Time Will the Purchase Process Take? Our organization doesn’t believe in wastage of your time. It never has a lengthy, confusing or messy purchase process. The purchase process for Recovery Tool will take ONLY 15 minutes. You will not have to wait for long hours or days for the activation details. They will be mailed instantly within 15 minutes after the purchase of the product. You should also check your SPAM/Junk folder for our email and also make sure that your email servers/spam filters do not block our mails. Do I Have to Pay the Whole Amount at The Start? Yes! You have to pay the whole amount at the time you place your purchase order. We have two purchase options, one for the PayPal users and second for the Credit Card Users. You can choose either of these options to pay the amount. When you click the “Buy” Button, a form will come on your screen where you will be asked the information including your credit card number. For Queries Regarding Purchase, Whom Should I Contact? For any queries regarding purchase, you can comfortably contact our support team which is available 24X7 for your support. Also, there is online chat facility where you can chat with our prompt and proactive professionals. Both email and chat are instant help ways. Even if you choose to mail, you get quick reply.